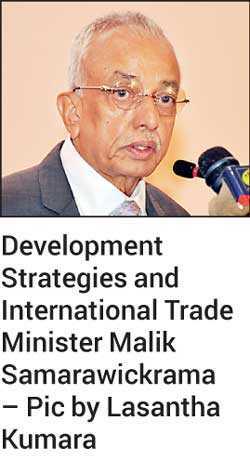 Development Strategies and International Trade Minister Malik Samarawickrama said it was difficult to get politicians to understand economic imperatives and therefore, it was essential for the Government to set policy, and the onus was on the voters to decide. As 2019 is an election year, when asked if the country’s policymakers are knowledgeable of the latest information to take decisions in the best interests of all Sri Lankans, the Minister responded that it was tough for politicians to know detailed economic concepts. “It is hard to know all the economic theories for a politician, but as long as the Government has consistent policies and we have a clear path, that’s what matters to us. It is up to the voters to vote as they think best,” he told journalists in Colombo on Thursday. Further, when asked if that wasn’t the responsibility of the relevant parties to nominate the best candidates, Samarawickrama said that politics is “quite different” to economics.